August 8, 2018 – August is Olympic Hot Tub’s anniversary month. 41 years ago, Blair Osborn & Alice Cunningham opened the first company in the Northwest to exclusively carry hot tubs and promote health and wellness through hot water. Their little shop was tucked away on Northlake Way near Lake Union and grew into a business with five retail locations in the region. Today, I’m pleased to announce that we’ve expanded our presence and opened our sixth showroom in Woodinville. I put a lot of thought into how I wanted this new showroom to look and feel. If you’re ready to take your health and wellness to a whole new level, I hope you’ll visit us there and make the decision to own your very own Hot Spring Spa or Finnleo Sauna. This showroom has sixteen hot tubs on display, so you will certainly find something that will be just right for you! We also have four Finnleo Saunas to show you, including a custom design sauna. The custom sauna will give you an idea of what we could create for you in that space in your own home that might not get a lot of use. We’ll help you transform it into the sauna paradise you’ve always wanted! One of the things Olympic is renowned for is our ability to let you “try before you buy”. We make an effort to have a wide array of tubs hot and ready for you. Test soaking is one of those things that really helps you know the tub you’re thinking about is the right one for you to invest in and enjoy night after night in your own backyard. 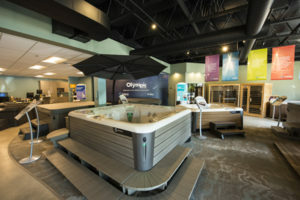 We have nine hot tubs in the showroom ready for a test dip! And, five of those tubs are equipped with Hot Spring’s exclusive ACE Salt Water System, so you can discover how wonderful it is to soak in healthy salt water that’s soft on your skin and easy to maintain. Want to get a glimpse of what a soak at night under the stars will be like for you? Our mood room will help you do just that. We have four hot tubs ready to try in an enclosed space with fiber optic lighting mimicking a starlit sky. If you’re in the Woodinville area and in the market for a hot tub or sauna (or know someone who is! ), I hope you’ll come by. We’ll do what we can to make sure you invest in a terrific tub or sauna just right for you and give you the very best service possible. That’s what Alice & Blair envisioned when they began Olympic 41 years ago, and it’s still our #1 goal today. Welcome to the Wellness Generation™, Woodinville! We’re in Woodinville Towne Center just around the corner form the Woodinville Café, and we’re thrilled to be here! We’re thrilled to see Olympic’s new Woodinville store up and running. It looks absolutely beautiful. Thank you for not only preserving our legacy, but improving on it. What a terrific celebration! Thanks for your ongoing commitment to excellence, and helping so many of us to live better each and every day! Thank you, Don! Thank you, Alice & Blair! Congratulations Don. Store looks beautiful.